Church has published 4 Adult Coloring Books. 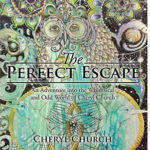 Her first The Perfect Escape “An Adventure into the Whimsical and Odd World of Cheryl Church”, published the summer of 2016 is a compilation of 25 drawings from her sketchbook. The 2nd Fantasy Coloring Book is The Perfect Escape Visionary and Fantasy. After her travels to Santa Fe, New Mexico, on Route 66 Church became fascinated with the landmarks and began her research and sketching. The Perfect Escape “An Adventure on Route 66,” is a montage of 36 full pages of coloring opportunity with many little illustrations throughout. The Perfect Escape, An Adventure on Arizona Route 66 is the next in the Route 66 Series.